Put Your Skill(et)s to Work! To make the batter for the crust, in a medium bowl, combine chickpea flour, egg whites, and salt. Add 1/4 cup water, and whisk until smooth and uniform. Let thicken for 10 minutes. Meanwhile, in a small bowl, mix seasonings into tomatoes. Bring a 10-inch skillet sprayed with nonstick spray to medium heat. Add pepper and onion. Cook and stir until mostly softened, about 3 minutes. Transfer to a medium bowl, and cover to keep warm. Remove skillet from heat; clean if needed. Re-spray, and return to medium heat. Pour batter into the skillet, quickly tilting the skillet in all directions to evenly coat the bottom. Cook until lightly browned and cooked through, about 2 minutes per side, flipping carefully with an offset spatula or flexible rubber spatula. Still in the skillet, top crust with seasoned tomatoes, leaving a 1/4-inch border. 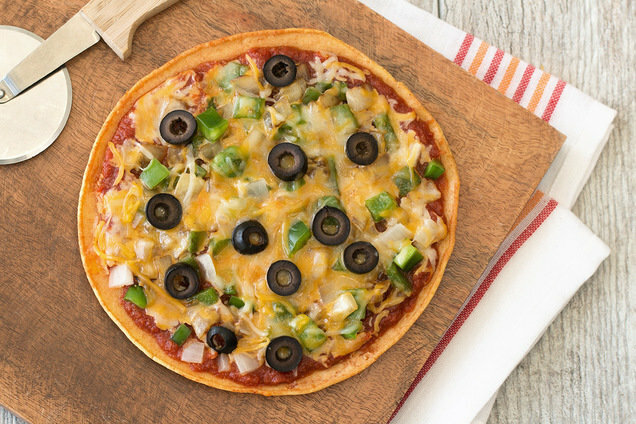 Sprinkle with cheese and top with cooked veggies and olives. Cover and cook until cheese has melted, about 2 minutes. HG FYI: Chickpea flour is a must for this recipe, and it’s worth seeking out. Sometimes called garbanzo bean, besan, or gram flour, this gluten-free ingredient has fewer carbs and more fiber than its wheat counterpart. Look for it in the ethnic foods aisle (it’s a staple in Indian cooking), or order it online. Bob’s Red Mill is our go-to brand. Hungry for More Unconventional Pizza Recipes? Like you need more reasons to share a pizza recipe. Click "Send to a Friend" now, because PIZZA.